Razor bumps are the bane of any person who shaves regularly. Although often you’re doing something wrong if you’re experiencing razor bumps when you’re shaving, often there’s literally nothing you can do. Razor bumps come part and parcel with shaving, and although you can minimize them by shaving properly, you’ll often still find them pop up every now and then. Fortunately, there are precautions and steps that you can take to combat razor bumps effectively. Even if you don’t experience razor bumps all the time, you should still be sure to have some razor bump cream to hand to help deal with any that you experience. Tend Skin liquid is one of the only formulas that’s specifically designed to deal with razor bumps. Though the other formula around work well too, this is a good option if you want something specifically designed to deal with the issue at hand. This liquid isn’t just for use after you’ve shaved. You can also apply before you go to sleep in the evening – this will help to clear up any existing razor bumps and existing issues you’re dealing with. Whether this be on your face, scalp or elsewhere. 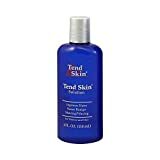 Tend Skin liquid also works extremely well for dealing with post waxes and ingrown hairs. Ingrown hairs can really be a nightmare, so it’s worth investing in a good liquid or cream that can help relieve this. 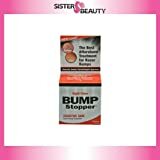 Another skin conditioning treatment that was specifically designed to deal with itchy skin is the High Time Bump Stopper. It works extremely well for anyone who has been dealing with razor bumps for an extended period of time – weeks and months. To get the best results, you’ll need to use this at least twice a day. It’s probably best to use it in the morning and again in the evening to space things out, but you don’t necessarily have to do this. The company state that you’re guaranteed results within a few days (I don’t know how you can guarantee that, but it’s nice to see a company that’s confident in it’s product). It also works well if you’re experiencing psoriasis, though in my opinion there are better products for that on the market (Neutrogena’s T Gel and T Sal spring to mind). Kerah Lane is a good all formula that works well if you’re trying to keep your scalp healthy. Not only does it work for the scalp, but it also works well for other areas. The ingredients in this Kerah Lane serum make it perfect for other issues like acne too. This is because it’s completely alcohol and paraben free – almost a necessity if you have particularly sensitive skin. The lavender in this formula also helps with any acne that you’re experiencing. One way to avoid razor bumps is to use a good shaving gel. Doing this can help to prevent razor bumps before they even appear. Bump Patrol Shave Gel is designed specifically to deal with razor bumps and other skin irritants. This formula has actually been proven to work against irritation – it’s dermatologist approved. Like most other formulas, it contains aloe vera. You’ve likely heard that aloe vera is one of the best things to use if you have sensitive skin. It helps to keep the skin hydrated, which is important if you want to keep your skin healthy. Overall, there are tons of sensitive skin shower gels that are available and it’s worth looking around and finding one that works well with your skin. Firstly, you want to clarify that you’re actually dealing with razor bumps. There’s also the chance that you might be dealing with acne, so it’s important to know the difference between the two. Ensure you know what your irritation is so you can treat it appropriately. Aside from using a razor bump cream, there are other things that you can do to help reduce the irritation. One of the best things that you can do is start to exfoliate your skin. Pick up a cheap exfoliating brush is a great way to do this. Fortunately, razor bumps are relatively easy to treat – though they can be a bit of a pain. Overall, razor bumps really aren’t the end of the world. I’ve been shaving for many years, and now I barely get them. Finding the right type of razor to work with your skin is also an essential part of avoiding razor bumps in your skin. Use tea tree oil to help clean up any bacteria. Witch hazel can be used to reduce oil in the skin – it’s a natural antiseptic. Even just a simple hot compress can help allow open up the pores. If you’re dealing with razor bumps, then a good quality cream is essential to helping restore your skin to it’s former self.